We all love to laugh. It makes us all feel great and makes our lives a bit let stressful, even if just for a moment. 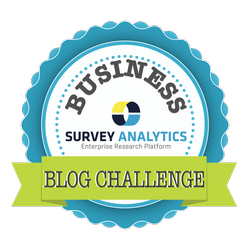 Day 4 of our Business Blog Challenge is designed to share a laugh with others in your industry. Comics are fun. Comics are shareable content. Try creating your own comic strip about your industry or find one on Dilbert or your favorite source for business comics. or refer to an article from Mashable to see 6 Free Sites for Creating Your Own Comics. Continue reading and we have a comic we made ourselves and a great one we found on Dilbert to share with you. Our comic strip we made is about setting the record straight for the term "mobile surveys." Just because the survey displays on a mobile device, does that mean it is really mobile? Is it designed and trusted to collect the information you need? Is it scalable to collect a high volume of data? We should spend more time lining up our strategy to recruit and connect with mobile audience and leave the programming to the pros and trusted tools out there. This procrastinator thought he could quickly program and show his survey to display mobile for a presentation to the research team this morning to use for their upcoming study. The second comic we would like to share is one we found from Dilbert and we also shared this a couple of months ago during a waiting room for a webinar on "How to Take Your Employee Temperature." It highlights on the skepticism employees have about giving their honest feedback on so called "anonymous" employee surveys. The key is to catch information from your employees in an environment where they can be honest and receptive. Even if they give their honest feedback, will they see any action taken? Is their opinion really valued? It's important to be more timely and tap into how our employees feel. Find the smoulders before they come fires.